Lovin’ thunder thighs. 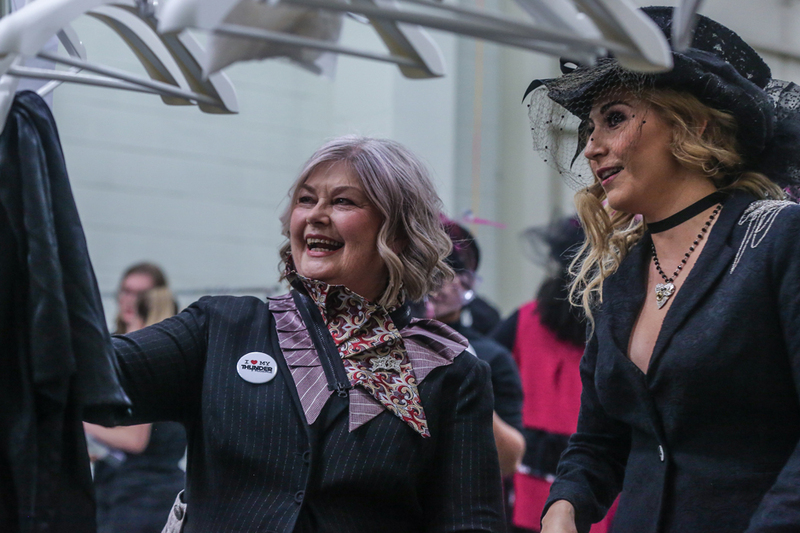 Designer Bronwynne Jones with model Swan Ricco at FASHFEST 2017. Image: Avon Dissanayake. For years, Brownynne Jones was frustrated with fashion, so much so that she started her own label. We all have different shapes—hour glass, watermelon, banana, apple and pear. While there’s absolutely nothing wrong with that, says Bronwynne, the reality is that it’s easier to shop fashion for some shapes than others. Bronwynne is pear shaped and proud of it. Image of Tiahna taken at FASHFEST 2017 by Naimat Ahmed. Thunder Thighs is a label for the perfectly pear shaped, although Bronwynne now knows her designs fit a range of shapes, even the tall and thin. ‘It was fabulous to discover this, although the pear-shaped is still my main aesthetic,’ says the designer. This Thursday, at M16 Artspace, Brownynne is launching an exhibition as part of Design Canberra Festival. ‘Curvature Couture: Design and the pear-shaped woman’ officially opens at 6 and runs until 25 November. M16 is where Bronwynne has her studio. The exhibition showcases what Bronwynne does best—focus on shape as a feature not as a flaw. She’ll host a short fashion event using a combination of models with interesting shapes, such as Bec and Trish from HAUS Models. She’ll also use women who aren’t professional models. The common thread is that every woman who appears in the show is in love with their body shape and fashion. Bec from HAUS Models. Image: Naimat Ahmed. Sustainability is important to Bronwynne and she’s committed to using new and natural fabrics as much as possible and sourcing interesting roll ends and remnants. She also uses pre-loved garments, deconstructing them and using elements in her designs. A classic example is Bronwynne’s hugely popular ‘Shirt Front Back Top’, which she’ll present at ‘Curvature Couture’. Bronwynne’s famous ‘Shirt Front Back Top’. Image: Naimat Ahmed. At the opening of Curvature Couture, and throughout the exhibition, guests can check out their shape against life-sized panels by String, local artist Paul Martin. The garments on the catwalk will be put on mannequins after the show and form part of the exhibition. 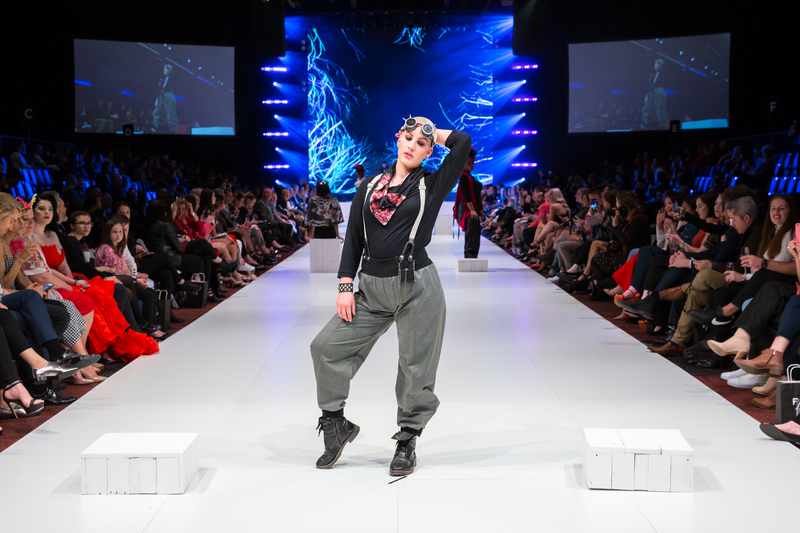 Brownynne presented her first full collection on the catwalk at FASHFEST in 2017. Image: Doug Hall, Studio Vita. You can also hear Bronwynne talk about her designs at M16 on 15 November at 1pm. She’ll also present a short workshop on dressing thunder thighs on 25 November at 2pm. In the meantime, join Bronwynne at ‘Curvature couture: Design and the pear-shaped woman’ for the official opening this Thursday, 8 November, at 6pm. The fashion show starts around 6.30. 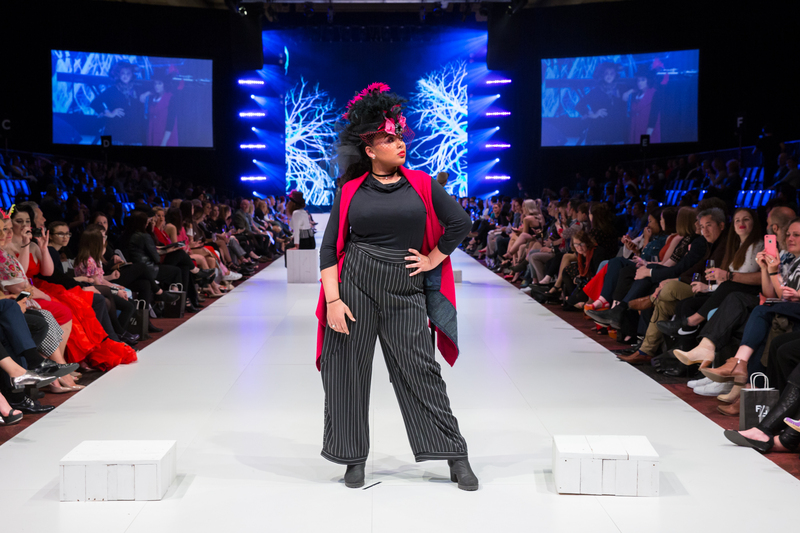 This entry was posted in LFW Style, LFW Your Canberra and tagged Bronwynne Jones, Canberra designers, Canberra Fashion, Curvature Couture, FashFest, HAUS Models, M16 Artspace, Paul Martin, String, Thunder Thighs on November 5, 2018 by gracienumber1.